NBC’s believe reviewed: The new J.J Abrams show is a clichéd mess. Could Alfonso Cuarón and J.J. Abrams Make a Messy, Cliché-Ridden TV Show? 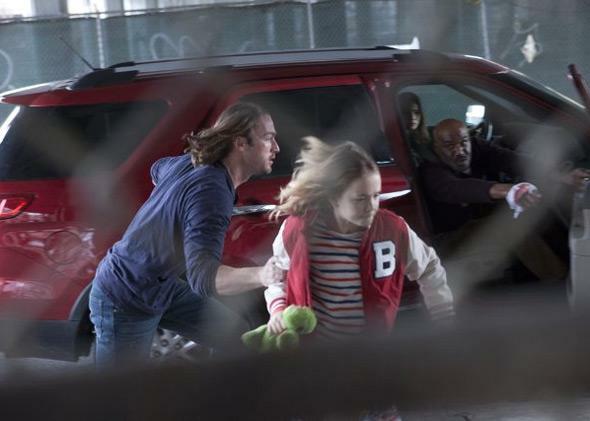 Jake McLaughlin, Johnny Sequoyah, Jamie Chung, and Delroy Lindo in Believe. Believe, NBC’s new, glossy J.J. Abrams–produced and Alfonso Cuarón–directed drama, begins in medias car chase, when an SUV carrying a kind couple and a sweet little girl singing a creepy lullaby is driven off the road in the rain by a female assassin hunting that same girl, whose name is Bo (Johnny Sequoyah). (People of television: Do not get in cars. Your chances of getting in a wreck are 90 percent.) The grown-ups get their necks snapped, the kid gets rushed to the hospital, and Believe is off, cycling so fast through clichés that it briefly seems like they are being deployed playfully, as with Abrams’ best work, remixed in a knowing way. They are not. Before we find out what happened to Bo, we arrive at a prison, where a convicted murder named Tate (Jake McLaughlin) is hiding slashing cheekbones under a Robinson Crusoe look and waiting to be put to death in less than an hour despite avowing his own innocence. Luckily for Tate, some top-secret governmental-seeming organization headed up by a man named Winter (Delroy Lindo) has decided to spring him. (Game of Thrones does not exist in the Believe universe, and I know this because no one makes “Winter is coming” jokes, even when asking when Winter is coming.) Tate’s new mission, should he choose to accept it—and he has no choice—is to take care of Bo, who has supernatural powers and has cycled through dozens of caretakers, most of whom have ended up dead. Some people “think whoever controls her ability will control the world,” Winter tells Tate, before entrusting her to this wanted con with zero resources. The rest of the pilot proceeds at this frenzied pace: multiple fight scenes, even more close escapes, scads of banter, a car chase or two, sightings of a very fluttery and metaphorical butterfly, some visions of the future, and an altruistic mission to help a sad doctor stick with his job—that last bit a hint that Believe is going to be structured around a cheeseball case of the week rather than its mythology. All the while, Bo and Tate are feeling each other out: Will the criminal learn to love the kid? Has this kid finally found someone she can trust? Do you have to ask? It is a terrible sign when a show has no sense of humor, but Believe almost has too much of it. It looks great—Cuarón, who just won an Oscar, directed, after all—but there is something off-puttingly cutesy about it. It’s not just Abrams-trademark banter, but a fundamentally silly setup, as if Agents of SHIELD or even Alias found itself caught inside a serious and stentorian body. There’s no mood. The bad guy’s name is Roman Skouras (Kyle Maclachlan), which you should say with Batman voice. A very well-informed, seemingly powerful organization of good guys is on the run from … one assassin. Bo’s superpower manifests as an ability to recreate Alfred Hitchcock’s The Birds. It is very difficult to tell from a pilot what kind of TV show will follow, and Believe is more confounding in this regard than most. Is this a conspiracy show? A case-of-the-week show? A dramedy with fist fights? Paper Moon with supernatural powers? (If it turns out to be the last, I will be back in a few weeks, apologizing for ever insulting it.) The lack of clarity didn’t leave me eager to find out more. I was too caught up wondering, why, if this girl’s safety is so imperative to the fate of the free world, the United States government doesn’t have a massive security detail on her at all times? I think the answer might be: that would make too much sense.